Do wasps or hornets use old nests? Jump Menu: Do wasps or hornets use old nests? I have an old wasp nest, what should I do? I have a wasp nest but it is not visible, can it be destroyed? What type of bees nest in brickwork? How many wasps are in a nest? We have never seen a wasp nest re-used. Occasionally a new nest will be built alongside an old one, and very often the same loft space will be used year after year, but this means that it is an ideal place for wasps to nest. It makes perfect sense for wasps and hornets to establish new nests each year as it will prevent a buildup of disease and parasites which could affect the colony. I have an old wasp nest, what should I do? 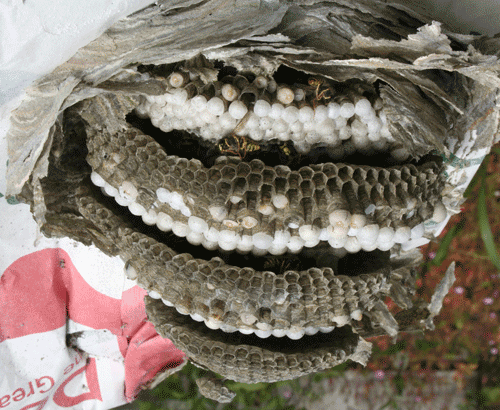 If you have an old wasp or hornet nest that is not in the way, we suggest you leave it where it is. Wasps and Hornets never reuse old nests. The location is ideal for wasps to nest and if you remove the existing nest, you are making space where a new nest could be constructed. If however, you need to remove the nest, first make sure the nest is not active. A wasp nest is very easy to remove, wrap a bin liner around the nest and pull the nest into the bag and dispose of it. Nests are very fragile and will break apart by simply crushing it with your hand. The nest is made from dead wood which the worker wasps gather over the summer. I have a wasp nest but it is not visible, can it be destroyed? We often treat nests which are not visible, in cavity walls, underground, under patios etc. It does not matter if you cannot see the nest. If you can see wasps entering and leaving from a particular spot, we can kill it. What type of bees nest in brickwork? If bees are nesting in holes in the mortar and are using lots of different places they are mason bees. They are solitary bees and harmless. They are not destroying the cement. The mortar has become soft enabling the bees to burrow into it. To solve this problem, you will need to have your brickwork re-pointed. 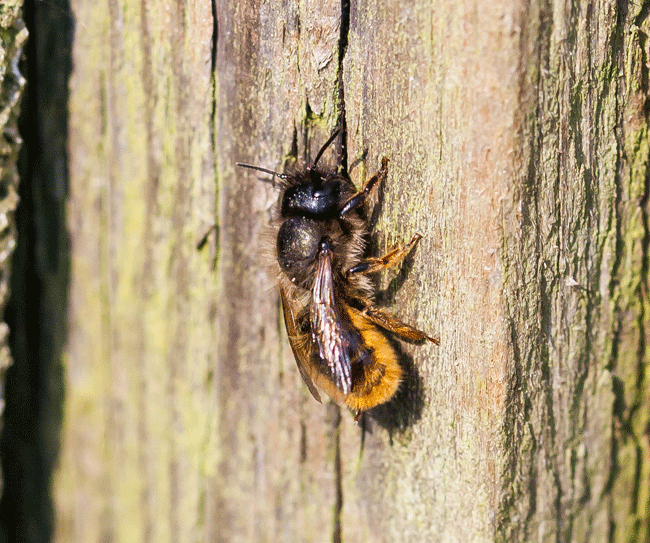 Mason bees cannot sting you. Generally, the number of mason bees on any single building will be between 5 -20 bees, we have seen over a hundred, but this is unusual. Mason bees pack mud into the holes once they have laid eggs and this is a visible sign that you have mason bees at work. If just one hole is in use and there are lots of them regularly entering and leaving every day, it could be wasps or honey bees and needs further investigation. If in doubt give us a call. How many wasps are in a nest? The number of wasps in a single nest is continually changing. The nest starts with just one wasp, the queen. She lays eggs, and once these first eggs have hatched, she deposits more eggs into the now vacant cells. Worker wasps continue to expand the nest making more cells for the queen in which to lay her eggs. Numbers of worker wasps increase throughout the summer and peak around August. The population of an individual wasp nest at peak density will depend on the weather, food and size of the nest. In the UK, the largest nest size could support around 10,000 individuals. A small nest would support around 2000 -3000 individuals. These are just example numbers. Hornets and European wasp numbers are much lower.